The State Party of Germany, in its letter dated 30 January 2008 provided the World Heritage Centre with a map of a buffer zone, as requested by the World Heritage Committee. 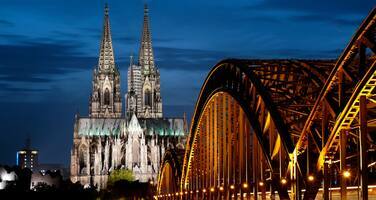 It covers the east bank of the Rhine with the size of 258 hectares. This buffer zone was already adopted by the City Council of Cologne on 14 December 2006, but was not officially submitted to the World Heritage Centre according to the procedures in place. In order to ensure the effectiveness of the buffer zone, the State Party stated in its report that ”any future planning decision and measures in the Cathedral buffer zone will take into account the outstanding universal value and the visual integrity of the World Heritage site”. The boundaries of the buffer zone were transmitted to ICOMOS for review, as a minor boundary modification (to be discussed under Item 8 of the Agenda – Document WHC-08/32.COM/8B.Add). As part of the consultation process, a workshop was held for the design of a planning framework for the site of Cologne/Deutz, the ICE railway terminal and its surroundings. Its results were presented in the State Party report of 2007 defining three World Heritage status compatible solutions for the area of the Kölnmesse/ Deutz train station. Based on the three proposals, framework requirements have been formulated for the planning decisions. No further decision regarding the implementation of a proposal has been taken at the time of the preparation of this document. 5. Requests the State Party to submit to the World Heritage Centre, by 1 February 2009, a detailed report on the progress concerning the proposals of urban development in the Deutz area. 4. Recommends that reflection should continue concerning the limits of an extended buffer zone based on historic criteria. 1. Requests the State Party to submit to the World Heritage Centre, by 1 February 2009, a detailed report on the progress concerning the proposals of urban development in the Deutz area.